My DBT Life: A wise mind: A.C.C.E.P.T.S. 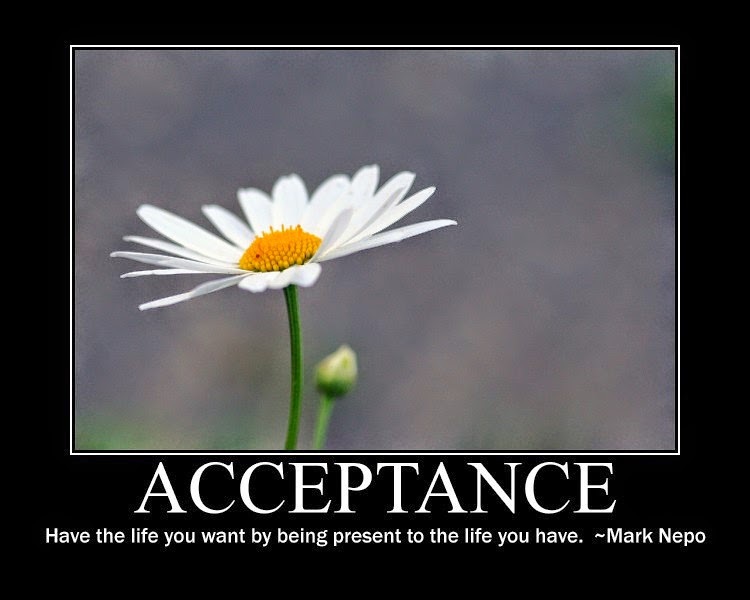 Acceptance is a skill all to itself and the acronym A.C.C.E.P.T.S. is a specific skills set in the Distress Tolerance module of the DBT program, but I blur the lines a bit on these skills because I truly feel they go hand-in-hand in making progress towards a mentally healthful life. I had all of this information ready to write regarding these concepts and when I went hunting for a picture to accompany my post, I ran across this blog. I could not have stated what ACCEPTS means better than her article. Please give it a look-see. Remember, acceptance is not the same thing as agreeing with whatever you are in need of accepting. Remember, we are using ACCEPTS to distract us from a temporary distressful situation. Remember, a single moment in time does not define us. Share your thoughts and experiences with us! Next group is this Saturday at 3 pm Pacific Time.